Send us your stories. We’d love to hear and share! Whether you are a bodybuilder, powerlifter, CrossFitter, yogi, or runner, Spot Me Girl encourages any kind of activity that gets your booty off the couch! And who said you’re limited to just one? We reached out to Melissa Sidki, a young woman who is passionate about two unlikely combinations: CrossFit and pole dancing. Spot Me Girl: So, tell us a little bit about yourself. Melissa Sidki: I am a 20-year-old living in the UK. Over the past five years, my passion for fitness has grown immensely, and I recently turned my hobbies into a career. I am a CrossFitter, pole dancer, hoop artist, and have also competed in a bikini competition. I have been CrossFitting for just over two years and Pole Dancing for five. My favorite benchmark workout has to be “FRAN”(a couplet of barbell thrusters like front squat/push-press comb and pull-ups) even though it kills me every time. I love trying out new things and different ways to train! 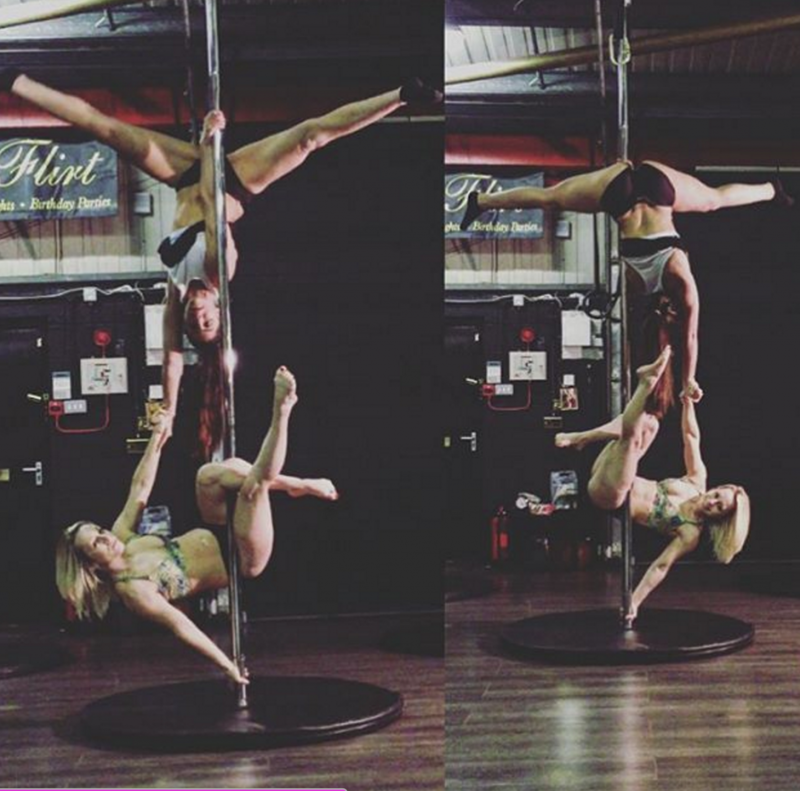 SMG: Pole dancing and CrossFit are so different! How did you get introduced to each of them? MS: I was 14 when I first started pole. I remember watching a video online. Right away, I knew I wanted to give it a try. I was still very young, so it started as a hobby while in school. I never imagined it to be such a big part of my life as it is today! In 2013, I was introduced to CrossFit. I had also watched a video online and wanted to give it a try. SMG: Do you enjoy one over the other? If so, why? Do they compliment one another? MS: I wouldn’t say I prefer one over the other. They are both completely different, and I feel a different sense of achievement when training both sports. Yes, they compliment each other to an extent. When I first started CrossFit, upper-body movements like pull-ups came more naturally to me than it did for others. CrossFit really has helped me over the years. I am achieving much stronger isometric holds, my endurance level has improved massively, and has made me a much better all-around athlete. SMG: What’s your favorite pole dance figure or move? SMG: There’s a bad stigma attached to pole dancing. Have you ever felt/been judged for it? MS: Never. I don’t tend to pay attention to what others think of me; I just do what makes me happy. When I first started, trying to persuade my dad was a different story. We spent a week arguing about it, and I ended up sneaking off and going by myself. However, years ago, pole dancing was not common or considered as a way to stay fit. Thankfully, we have some amazing people in our industry who have pushed it to where it is now, and I hope it continues to grow. SMG: What’s the best piece of advice you would give to a new competitor? MS: I think that the concept is the same in any sport: train and train hard. It may get tough at times, but give it your 100% and never give up. Always surround yourself with positive people who are going to help motivate and support you. As long as you give it your 100%, you can turn around and say you gave it your all. And most importantly, on comp day, stay calm! Remember that you are in a better position now than where you were when you first started. That is already such a massive achievement. Compete with yourself and no one else. SMG: Looking at your Instagram photos, you are so bendy! Were you always naturally flexible, or did you have to work at it—If so, what did you do to improve? MS: Ever since I can remember, I have been bendy. At a young age, I participated in gymnastics, dance, and many other sports at school. Since I’ve started CrossFit, I have become A LOT stronger. It has changed my body completely. Although, I am more stiff (in my eyes), I am happy that I have balance. I have a good amount of strength and flexibility. Recently, I wanted to increase my flexibility again. I decided to go to a fitness professional who specializes in flexibility. I could probably do it myself, but I need someone to push and motivate me at times. SMG: I’m really trying to improve my flexibility! What’s the best piece of advice you’d give to someone who is trying to improve? MS: With anything you do, you MUST stay consistent! First ask yourself why you want to improve your flexibility. What range do you want? And do you know how to target the areas that need work? Once those are established, you must be patient and push yourself! The body takes time to adapt to new things. Static holds are always best for increasing your range as it allows the muscles to relax and be stretched at a greater length. Remember to warm up properly and set yourself a goal to stretch a certain amount of time each week! SMG: What’s your favorite lift? SMG: We all know diet is the hardest part. Can you share a summary of how you approach diet and nutrition? MS: Dieting is hard. The only time I have really “dieted” was when I competed for my bikini competition. At the time, I had no idea what I was doing, or what I was getting myself into, but I gave it my best shot. I wouldn’t really say I have a strict diet. I mainly eat for my goals and to fuel my training sessions. I watch what I eat carefully, consisting of whole foods with a healthy amount of fats, protein, and carbohydrates. I watch my sugar intake, but treat myself every once in a while too! I am a meat eater and my favorite dishes are anything with seafood. I am not a fussy eater and always like to try new foods. I also love making smoothies my current favorite has to be my green shake: apple, kale spinach, ginger, cinnamon and almond milk or coconut water. SMG: We all have those days when we’re tired and just don’t feel like training. How do to motivate yourself when this happens? MS: I often experience days like these because of the UK weather. The cold really demotivates me, but I just get up and get on with it! As soon as I put my workout clothes on, I am already in a better mood. Music helps and having a good breakfast gets me going. If this happens, you’re allowed to take a day off. I think people often forget about the “health” in health and fitness. It is not going to harm you if you have a day of relaxing. SMG: While lifting, does your music preference change versus when you’re pole dancing? MS: While lifting, I have no choice. I am usually stuck listening to whatever the guys play at our box. Haha! It’ll range anything from “The Fresh Price of Bel Air” to Kid Rock, Justin Bieber, heavy metal, Vanilla Ice, you name it, they have it! I like listening to powerful artists like Beyoncé or Eminem. With pole, anything goes. If I am training for a competition, the music may slightly change depending on the theme and type of competition, but I like chart music. You can never go wrong with Rihanna! Anything I can sing along to makes me happy! Thanks so much for taking the time to chat with us! Good luck!